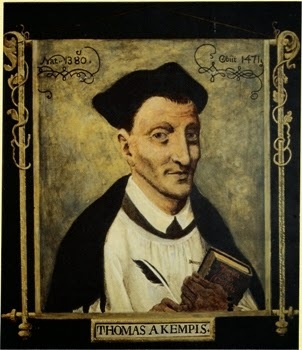 Thomas à Kempis. (b. 1379 or 1380, d. 1471). The Imitation of Christ. While Europe was shaken with wars, Thomas à Kempis lived in happy seclusion in his convent. His writings convincingly reflect the serenity and happiness of a man who has found peace - a peace that surpasses all understanding. HE that followeth me shall not walk in darkness, 1 saith the Lord. These are the words of Christ; and they teach us how far we must imitate His life and character, if we seek true illumination, and deliverance from all blindness of heart. Let it be our most earnest study, therefore, to dwell upon the life of Jesus Christ. 2. His teaching surpasseth all teaching of holy men, and such as have His Spirit find therein the hidden manna. 2 But there are many who, though they frequently hear the Gospel, yet feel but little longing after it, because they have not the mind of Christ. He, therefore, that will fully and with true wisdom understand the words of Christ, let him strive to conform his whole life to that mind of Christ. 3. What doth it profit thee to enter into deep discussion concerning the Holy Trinity, if thou lack humility, and be thus displeasing to the Trinity? For verily it is not deep words that make a man holy and upright; it is a good life which maketh a man dear to God. I had rather feel contrition than be skilful in the definition thereof. If thou knewest the whole Bible, and the sayings of all the philosophers, what should all this profit thee without the love and grace of God? Vanity of vanities, all is vanity, save to love God, and Him only to serve. That is the highest wisdom, to cast the world behind us, and to reach forward to the heavenly kingdom. 4. It is vanity then to seek after, and to trust in, the riches that shall perish. It is vanity, too, to covet honours, and to lift up ourselves on high. It is vanity to follow the desires of the flesh and be led by them, for this shall bring misery at the last. It is vanity to desire a long life, and to have little care for a good life. It is vanity to take thought only for the life which now is, and not to look forward to the things which shall be hereafter. It is vanity to love that which quickly passeth away, and not to hasten where eternal joy abideth. 5. Be ofttimes mindful of the saying, 3 The eye is not satisfied with seeing, nor the ear with hearing. Strive, therefore, to turn away thy heart from the love of the things that are seen, and to set it upon the things that are not seen. For they who follow after their own fleshly lusts, defile the conscience, and destroy the grace of God. Note 1. John viii. 12. Note 2. Revelations ii. 17. Note 3. Ecclesiastes i. 8. THERE is naturally in every man a desire to know, but what profiteth knowledge without the fear of God? Better of a surety is a lowly peasant who serveth God, than a proud philosopher who watcheth the stars and neglecteth the knowledge of himself. He who knoweth himself well is vile in his own sight; neither regardeth he the praises of men. If I knew all the things that are in the world, and were not in charity, what should it help me before God, who is to judge me according to my deeds? 2. Rest from inordinate desire of knowledge, for therein is found much distraction and deceit. Those who have knowledge desire to appear learned, and to be called wise. Many things there are to know which profiteth little or nothing to the soul. And foolish out of measure is he who attendeth upon other things rather than those which serve to his soul’s health. Many words satisfy not the soul, but a good life refresheth the mind, and a pure conscience giveth great confidence towards God. 3. The greater and more complete thy knowledge, the more severely shalt thou be judged, unless thou hast lived holily. Therefore be not lifted up by any skill or knowledge that thou hast; but rather fear concerning the knowledge which is given to thee. If it seemeth to thee that thou knowest many things, and understandest them well, know also that there are many more things which thou knowest not. Be not high-minded, but rather confess thine ignorance. Why desirest thou to lift thyself above another, when there are found many more learned and more skilled in the Scripture than thou? If thou wilt know and learn anything with profit, love to be thyself unknown and to be counted for nothing. 4. That is the highest and most profitable lesson, when a man truly knoweth and judgeth lowly of himself. To account nothing of one’s self, and to think always kindly and highly of others, this is great and perfect wisdom. Even shouldest thou see thy neighbour sin openly or grievously, yet thou oughtest not to reckon thyself better than he, for thou knowest not how long thou shalt keep thine integrity. All of us are weak and frail; hold thou no man more frail than thyself. HAPPY is the man whom Truth by itself doth teach, not by figures and transient words, but as it is in itself. 1 Our own judgment and feelings often deceive us, and we discern but little of the truth. What doth it profit to argue about hidden and dark things, concerning which we shall not be even reproved in the judgment, because we knew them not? Oh, grievous folly, to neglect the things which are profitable and necessary, and to give our minds to things which are curious and hurtful! Having eyes, we see not. 2. And what have we to do with talk about genus and species! He to whom the Eternal Word speaketh is free from multiplied questionings. From this One World are all things, and all things speak of Him; and this is the Beginning which also speaketh unto us. 2 No man without Him understandeth or rightly judgeth. The man to whom all things are one, who bringeth all things to one, who seeth all things in one, he is able to remain steadfast of spirit, and at rest in God. O God, who art the Truth, make me one with Thee in everlasting love. It wearieth me oftentimes to read and listen to many things; in Thee is all that I wish for and desire. Let all the doctors hold their peace; let all creation keep silence before Thee: speak Thou alone to me. 3. The more a man hath unity and simplicity in himself, the more things and the deeper things he understandeth; and that without labour, because he receiveth the light of understanding from above. The spirit which is pure, sincere, and steadfast, is not distracted though it hath many works to do, because it doth all things to the honour of God, and striveth to be free from all thoughts of self-seeking. Who is so full of hindrance and annoyance to thee as thine own undisciplined heart? A man who is good and devout arrangeth beforehand within his own heart the works which he hath to do abroad; and so is not drawn away by the desires of his evil will, but subjecteth everything to the judgment of right reason. Who hath a harder battle to fight than he who striveth for self-mastery? And this should be our endeavour, even to master self, and thus daily to grow stronger than self, and go on unto perfection. 4. All perfection hath some imperfection joined to it in this life, and all our power of sight is not without some darkness. A lowly knowledge of thyself is a surer way to God than the deep searchings of man’s learning. Not that learning is to be blamed, nor the taking account of anything that is good; but a good conscience and a holy life is better than all. And because many seek knowledge rather than good living, therefore they go astray, and bear little or no fruit. 5. O if they would give that diligence to the rooting out of vice and the planting of virtue which they give unto vain questionings: there had not been so many evil doings and stumbling-blocks among the laity, nor such ill living among houses of religion. Of a surety, at the Day of Judgment it will be demanded of us, not what we have read, but what we have done; not how well we have spoken, but how holily we have lived. Tell me, where now are all those masters and teachers, whom thou knewest well, whilst they were yet with you, and flourished in learning? Their stalls are now filled by others, who perhaps never have one thought concerning them. Whilst they lived they seemed to be somewhat, but now no one speaks of them. 6. Oh how quickly passeth the glory of the world away! Would that their life and knowledge had agreed together! For then would they have read and inquired unto good purpose. How many perish through empty learning in this world, who care little for serving God. And because they love to be great more than to be humble, therefore they “have become vain in their imaginations.” He only is truly great, who hath great charity. He is truly great who deemeth himself small, and counteth all height of honour as nothing. He is the truly wise man, who counteth all earthly things as dung that he may win Christ. And he is the truly learned man, who doeth the will of God, and forsaketh his own will. Note 1. Psalm xciv. 12; Numbers xii. 8. Note 2. John viii. 25 (Vulg.). WE must not trust every word of others or feeling within ourselves, but cautiously and patiently try the matter, whether it be of God. Unhappily we are so weak that we find it easier to believe and speak evil of others, rather than good. But they that are perfect, do not give ready heed to every news-bearer, for they know man’s weakness that it is prone to evil and unstable in words. 2. This is great wisdom, not to be hasty in action, or stubborn in our own opinions. A part of this wisdom also is not to believe every word we hear, nor to tell others all that we hear, even though we believe it. Take counsel with a man who is wise and of a good conscience; and seek to be instructed by one better than thyself, rather than to follow thine own inventions. A good life maketh a man wise toward God, and giveth him experience in many things. The more humble a man is in himself, and the more obedient towards God, the wiser will he be in all things, and the more shall his soul be at peace. IT is Truth which we must look for in Holy Writ, not cunning of words. All Scripture ought to be read in the spirit in which it was written. We must rather seek for what is profitable in Scripture, than for what ministereth to subtlety in discourse. Therefore we ought to read books which are devotional and simple, as well as those which are deep and difficult. And let not the weight of the writer be a stumbling-block to thee, whether he be of little or much learning, but let the love of the pure Truth draw thee to read. Ask not, who hath said this or that, but look to what he says. 2. Men pass away, but the truth of the Lord endureth for ever. Without respect of persons God speaketh to us in divers manners. Our own curiosity often hindereth us in the reading of holy writings, when we seek to understand and discuss, where we should pass simply on. If thou wouldst profit by thy reading, read humbly, simply, honestly, and not desiring to win a character for learning. Ask freely, and hear in silence the words of holy men; nor be displeased at the hard sayings of older men than thou, for they are not uttered without cause. WHENSOEVER a man desireth aught above measure, immediately he becometh restless. The proud and the avaricious man are never at rest; while the poor and lowly of heart abide in the multitude of peace. The man who is not yet wholly dead to self, is soon tempted, and is overcome in small and trifling matters. It is hard for him who is weak in spirit, and still in part carnal and inclined to the pleasures of sense, to withdraw himself altogether from earthly desires. And therefore, when he withdraweth himself from these, he is often sad, and easily angered too if any oppose his will. 2. But if, on the other hand, he yield to his inclination, immediately he is weighed down by the condemnation of his conscience; for that he hath followed his own desire, and yet in no way attained the peace which he hoped for. For true peace of heart is to be found in resisting passion, not in yielding to it. And therefore there is no peace in the heart of a man who is carnal, nor in him who is given up to the things that are without him, but only in him who is fervent towards God and living the life of the Spirit. VAIN is the life of that man who putteth his thrust in men or in any created Thing. Be not ashamed to be the servant of others for the love of Jesus Christ, and to be reckoned poor in this life. Rest not upon thyself, but build thy hope in God. Do what lieth in thy power, and God will help thy good intent. Trust not in thy learning, nor in the cleverness of any that lives, but rather trust in the favour of God, who resisteth the proud and giveth grace to the humble. 2. Boast not thyself in thy riches if thou hast them, nor in thy friends if they be powerful, but in God, who giveth all things, and in addition to all things desireth to give even Himself. Be not lifted up because of thy strength or beauty of body, for with only a slight sickness it will fail and wither away. Be not vain of thy skilfulness or ability, lest thou displease God, from whom cometh every good gift which we have. 3. Count not thyself better than others, lest perchance thou appear worse in the sight of God, who knoweth what is in man. Be not proud of thy good works, for God’s judgments are of another sort than the judgments of man, and what pleaseth man is ofttimes displeasing of Him. If thou hast any good, believe that others have more, and so thou mayest preserve thy humility. It is no harm to thee if thou place thyself below all others; but it is great harm if thou place thyself above even one. Peace is ever with the humble man, but in the heart of the proud there is envy and continual wrath. A Throne for Son or Stepson?